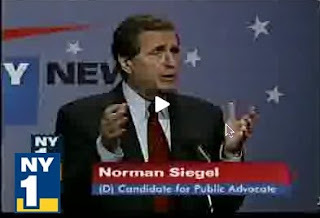 The Democratic Public Advocate debate last night on NY1 covered a lot of ground, but coverage in the Daily News and New York Times ignored candidate Norman Siegel's regular references to the issue of eminent domain, including its use for the Atlantic Yards project. The Times noted that Eric Gioia criticized Bill de Blasio; de Blasio targeted former Public Advocate Mark Green; Green cited his experience; and Siegel said he was the only person who didn't seek the job as a steppingstone. The Daily News noted that Gioia cited de Blasio's use of the Working Families Party's questionable political consulting offshoot and Green cited de Blasio's practice of taking campaign contributions from donors in groups to which he's provided discretionary funding. Green is well ahead in the polls, but has not polled the required 40% to avoid a runoff. De Blasio, who's led recently in fundraising and endorsements, is ahead of Gioia and Siegel, the two candidates who've opposed Atlantic Yards. 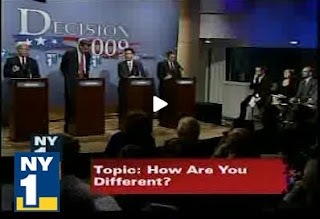 Siegel, in his opening statement, cited the overturning of term limits, racial profiling, and the treatment of 9/11 first responders, then added: " When the government takes private property, in Willets Point, in West Harlem, and Atlantic Yards, and abuses eminent domain, a Public Advocate needs to fight and challenge the status quo--I'll do that." Later, asked to comment on Mayor Mike Bloomberg, he said, "I'm against eminent domain when it takes private property and gives it to the big developers--and Bloomberg's been very bad on that." Asked if, after taking office, the mayor resigns and the Public Advocate takes over, would they run in 60 days, Green said yes, Gioia said probably not, and de Blasio refused to answer, calling it a hypothetical. Siegel said no, pointing out that it shows how he, unlike his rivals, doesn't see the office as a steppingstone. Similarly, asked the yes/no question if they'd endorse Gov. David Paterson if he faces a primary, Gioia, Siegel, and Green said yes, but de Blasio: wouldn't answer, calling it a hypothetical. Given the opportunity to ask a fellow candidate a question, Green went after de Blasio, saying, "I've been running a relentlessly positive campaign... Then Bill attacked me because I have a family member who's a successful brother in real estate. Let's talk about real conflicts, not relations of blood." Green said that de Blasio has given 180 groups some $17 million in member items in the last three years, then, received donations from people connected with those organizations. He asked if de Blasio would ban those gifts. De Blasio responded that "senior centers and youth leagues and nonprofits in our community" wouldn't be supported without the help of Council Members, and that Green's brother Stephen, who runs S.L. Green, "with his LLCs gave you over 139,000 dollars in the Attorney General's race," and has influence on the Real Estate Board of New York, which "has a big influence on the public debate and decisions in this city." Green said de Blasio didn't answer whether he'd ban "that kind of quid pro quo." "There's no quid pro quo, there's no coercive pressure, and it is night and day different from an interest group like the real estate industry exerting its power in the electoral process," de Blasio responded. Siegel asked de Blasio why he didn't blow the whistle on the Council scandal, in which it budgeted funds for fictitious organizations and why he didn't help those arrested falsely during the Republican National Convention. De Blasio praised Siegel for his "exemplary" role on the latter but said his rival's information on the scandal was "more than revisionist." Given that they're all progressive Democrats, what makes them different from their rivals on policy issues? Green cited his difference with de Blasio on banning member items. De Blasio said, unlike his rivals, he emphasized influencing the City Planning Commission--the Public Advocate has one appointment--to ensure local hiring on development project. Gioia, after speechifying a bit, said he disagreed with the way de Blasio was running his campaign, that it shouldn't take an audit from the Campaign Finance Board for him to "come clean." Siegel said that, unlike his rivals, he thought the Comptroller--who controls a larger staff and has budget experience--should be second in line to succeed the mayor. Siegel continued, "Second, development: eminent domain. I oppose what's happening in Atlantic Yards and Willets Point and in West Harlem. Mark and Bill have been on record supporting Atlantic Yards with the abuse of eminent domain. They talk about affordable housing, but you can't ignore the constitutional violation of the government taking private property and giving it to a private developer. Thats not what America's supposed to be about. That's not what New York is about. And that's a huge difference. And I've represented those people. We're in court and we'll fight. A public advocate should stand up to the big developers and Mayor Bloomberg on this issue." Gioia said, "I agree with Norman on eminent domain." De Blasio responded, "I'm proud to say I'm the only non-lawyer up here. But I think a lot of other people out there would say that Norman's interpretation of what the Supreme Court said is not correct. There are times when, in the interest of creating affordable housing and jobs for local residents, it is appropriate to use eminent domain, only if we're sure we're going to get a very substantial community benefit." Actually, the Supreme Court has set a much lower bar, as Green went on to explain, and that bar neither requires that eminent domain be used for affordable housing and jobs--the language of AY advocates--nor that "we're sure" such benefits will arrive. Indeed, there are substantial doubts about AY affordable housing. Green followed up: "The  Kelo [vs. New London] case said eminent domain is constitutional if it's reasonably related to a public benefit. Norman, I respect your opinion, but don't make believe that's the Supreme Court's opinion. By 5 to 4 they ruled against your opinion." Siegel responded, "It's very interesting that they ignore the Kelo decision, which said the process has to be fair and, when a developer is driving the process, it is unconstitutional. Mark, Bill, read Kelo and [Justice Anthony] Kennedy's decision." Actually, Kennedy's opinion is a nonbinding concurrence, not the opinion of the court. John Paul Stevens, in the opinion of the court, said the Supreme Court didn't intervene, in part, because the takings were part of a "carefully considered" development plan. Kennedy suggested factors--such as the fact that most beneficiaries were unknown--that, if not present, could raise red flags. Plaintiffs in the Atlantic Yards case, however, were unable to get federal courts to agree, nor to pursue the inquiry into favoritism that the lower courts in Connecticut performed. "What you have in Atlantic Yards is Forest City Ratner dominating this process," Siegel continued. "What you have in Columbia is Columbia dominating the process. And if you read the decision, it's not my interpretation. It's very clear what Kennedy has said. And the courts in New York are now going to have the opportunity to say to the Bloomberg administration and the developers: no." "The court disagrees with Norman Siegel," Green said. Gioia got the last word: "The court does disagree, but the Supreme Court has been wrong before. Justice [Sandra Day] O'Connor, writing in a dissent, said this might be legal, and this might be right, the way we're deciding it, clearly under the law, but that doesn't mean legislatures and municipalities should agree with it. Because... eminent domain abuse takes advantage of the little guy; if you're going to respect property rights, you've got to respect it for little guys like my dad and my family, not just big developers." Several state courts and legislatures, since Kelo, have tightened state eminent domain law, but New York has not done so. The state version of the Atlantic Yards eminent domain case will be heard by the Court of Appeals October 14.